As my readers surely know, The Time Bum loves him some microbrands. The best of them are founded by watch nerds, for watch nerds, delivering the creative designs and quality components we crave, at prices we can afford. Chip Yuen is one of those enthusiasts who has taken his hobby to the next level. He founded Aevig Watches earlier this year, and is now taking pre-orders for two debut models: the Huldra automatic diver, and the Corvid quartz field watch. Born and raised in the Netherlands, Chip discovered the watch community while researching a new purchase and never looked back. He is an udio-visual media professional with a background in fine art and industrial design. Inspired by the emergence of microbrands such as Halios, he began to experiment with watch design in 2007, sharing them in the Watchuseek Design Forum. In 2012 he submitted a design for the crowd sourced Watchuseek Chinese Mechanical Watch Forum dual crown watch, which was very well recieved, although not selected. He tried again with that forum's ST-5 project and was successful. While that watch was in production, he submitted designs for the Affordable Watch Forum watch and once again his work was selected for production. With two successful designs under his belt, he was inspired by another microbrand, Chris Vail's Lew & Huey, to take the next step. Once again, he submitted designs to the Watchuseek community, but this time for a vintage-inspired diver that he would produce and sell under his own brand, and thus, the Aevig Huldra was born. Aevig takes its name from the ancient Norse word for "eternal." As Chip describes it, his watches seek to "evoke a sense of everlasting memory" with a look that is "fresh yet classic at the same time." The Huldra is a perfect example of Chip's design philosophy. At first blush, this 200m diver is familiar, not unlike a Seiko 6309-7040 with its barrel shaped case, color coordinated dive bezel, and geometric markers. There is a bit of Doxa influence in the straight hour and minute hands and rectangle-tipped second hand. 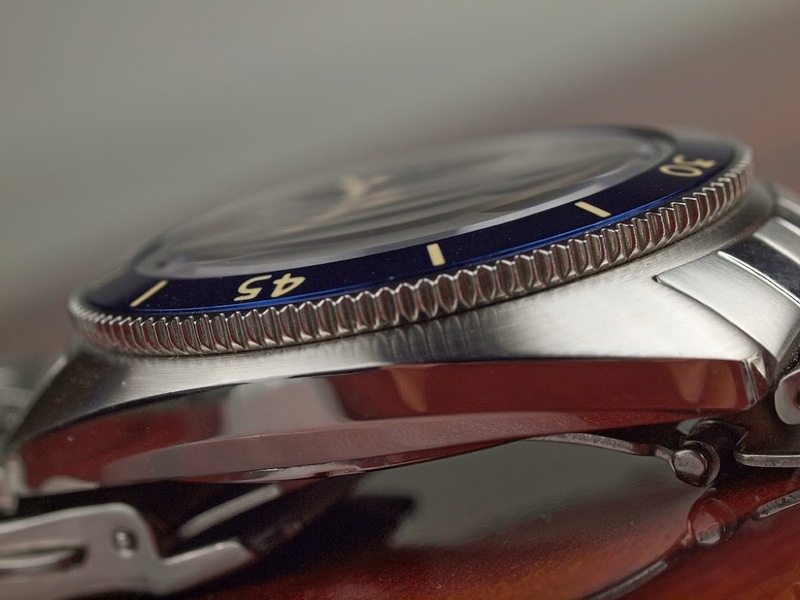 Yet, while the watch incorporates design cues from vintage divers, it is far from a homage. The polished and applied hour markers are hexagons instead of the usual circles, and quite cleverly, the Aevig hex logo at 12. Darts mark 3, 6, and 9. C3 Superluminova provides just the right bit of cream color to impart a proper vintage look. The case slopes gracefully away from the dial and forms a gentle arc from lug to lug, eschwing both the flatter profile of the Doxa and rounded sides of the Seiko. 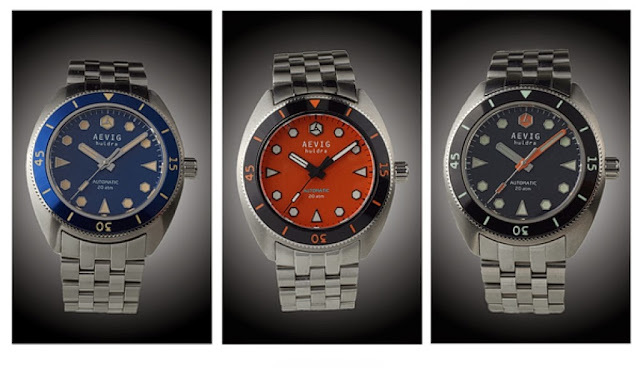 Bucking the trend of huge, bulky divers, the Huldra is 42mm x 46mm and only 12mm thick. A domed, antireflective sapphire crystal tops things off. It is a handsome watch, particularly striking in blue. The movement is a high-beat Miyota 9015 automatic. it is available in blue, black or orange, with a stainless steel bracelet and nylon NATO. 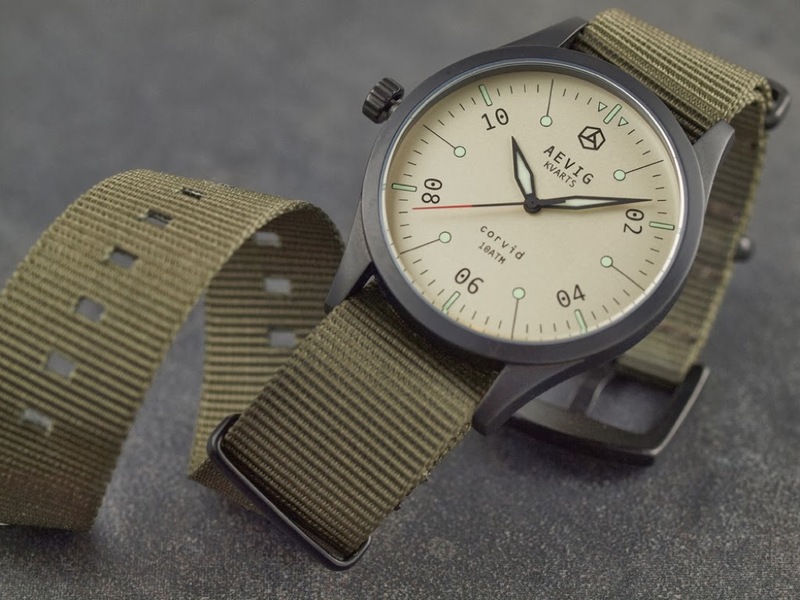 The Corvid began as a Bauhaus inspired excercise that made appearences in both the the ST-5 project and Affordable Forum submissions before it developed into the stylized military style watch it is today. The Corvid is powered by a Ronda 703 quartz. The DLC coated case is 40mm x 48mm and 9mm thick with a 9:00 crown and a domed acrylic crystal. The dial features black two-digit numerals at 02, 04, 08, and 10 with C3 filled bars. Lollypop markers topped with C3 occupy the remaining positions with a bar and Aevig hex logo at 12. Bold flieger style hands and a red-tipped second hand complete the face. 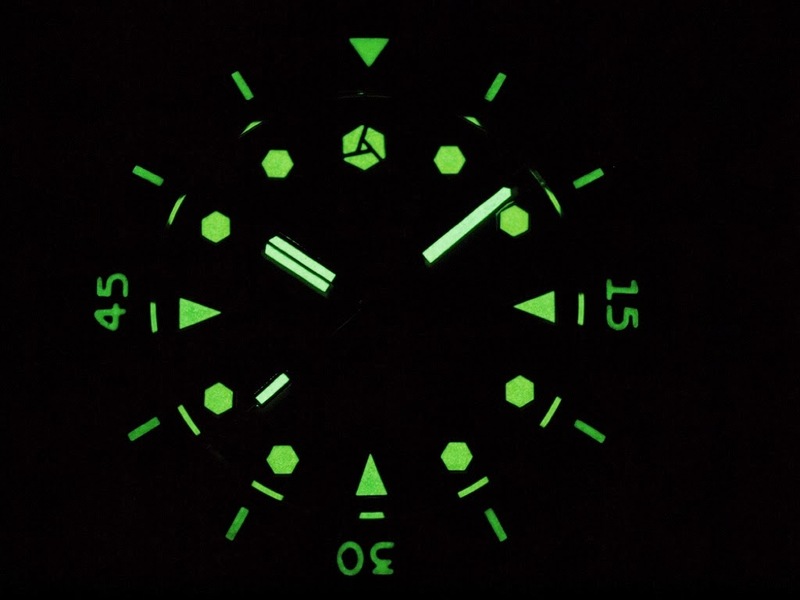 The Corvid is a unique desigh that draws insipration from traditional field and pilot watches, but with a thoroughly modern result. 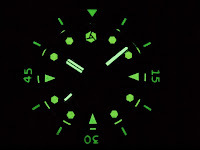 It is available with tan, black, or green dials. Water resistance is 100m. The Corvid will retail for €119, and is available for pre-order for €99, or about $136 USD at current exchange rates. The Huldra will retail for €399 and is available for pre-order for €359, or about $493 USD. These prices become even more attractive if you can subtract the 21 percent EU-only VAT (deducted in checkout). The pre-order period expires December 31, 2013. Assuming the debut models are successful, Chip has plenty of ideas for Aevig's future, including an automatic Corvid, a dual-crown compressor style diver, and a 1970s style automatic chronograph. After that, maybe a bicycle. "I'm Chinese and Dutch," he laughs, "we know bicycles, no?" Indeed, why not? It seems to be working for Shinola. The Time Bum has little use for bicycles, but if Chip designs an Aevig bicycle with same retro-modern sensibility as his watches, I might be tempted. All photos courtesy of Aevig Watches.